Have you been looking for a full-size SUV that can tackle a host of heavy-duty jobs and carry an incredible amount of cargo on a regular basis? 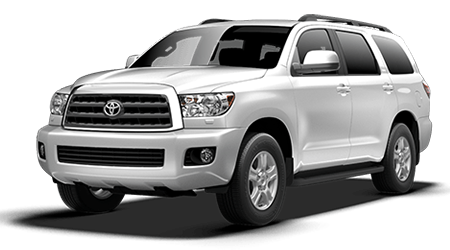 At Team One Toyota in Rainbow City, AL, we are delighted to house all of the latest Toyotas in stock including the 2016 Toyota Sequoia. Team One Toyota is one of Alabama's top-rated Toyota dealerships and has served Gadsden, Anniston, Albertville, Oxford and Jacksonville, AL for an extended period of time with an amazing selection of cars in stock. Come by Team One Toyota at 937 W Grand Ave. and explore the new Sequoia today. The 2016 Toyota Sequoia receives minor changes that make the SUV better. The large SUV can now be fitted with a Blind Spot Monitor and 2-position memory for the driver's seat and the mirrors on the Limited model. Additions have also been made to the Entune audio system that now lets drivers use their smartphone's navigation system through the Sequoia's head unit. With these new changes, the Sequoia is more comfortable on a daily basis and can be enjoyed with ease. To fulfill all of your daily needs and be able to do it all, the new Sequoia is available in a host of different models. With a variety of trims to choose from, you will be able to get into a full-size SUV that can do it all. The base SR5 has a MSRP of $48,190 and features: Entune Audio Plus system with connected navigation app, moonroof, seating for up to eight passengers, 18-inch alloy wheels, connected navigation app, three-zone climate control and more as standard. The next trim up is the Limited that starts at $56,980 and features: Entune Premium Audio system with integrated navigation, integrated navigation, heated front seats, parking assist sonar, 20-inch alloy wheels, Entune app suite, backup camera, automatic power liftgate and more as standard. The top-of-the-line Platinum has a MSRP of $64,720 and includes: Entune Premium JBL audio with integrated navigation, heated/ventilated front seats, second-row captain's chairs, 20-inch diamond-cut finish alloy wheels, seating for seven, Blind Spot Monitor (BSM) Lane Change Assist, adaptive variable suspension and more as standard. As a full-size SUV that can tackle a variety of tough jobs, the new Sequoia comes with an incredibly powerful powertrain that can tackle anything in your path. With the Sequoia's powerful engine, you can complete all of your driving needs with ease. The full-size SUV is equipped with a 5.7-L V-8 that generates 381 hp and 401 lb.-ft. of torque. The massive engine is matched to a 6-speed Electronically Controlled Automatic Transmission that can put power down through the rear wheels or to all four through an optional Multi-Model 4WD system. When properly equipped, the new Sequoia is rated to tow up to 7,300 lbs., which is enough to tackle a host of heavy-duty jobs. With the Sequoia's capable heavy-duty powertrain, you can enjoy driving the SUV everyday. When towing up to 7,000 lbs. and carrying up to eight passengers, the last thing you ever want to worry about is everyone's safety. To provide you with the confidence to use the full-size SUV on a daily basis, Toyota packed the vehicle with an extensive list of safety features. With the Toyota's lengthy list of safety features, you can rest assured knowing that you're safe at all times. The Sequoia comes with a Star Safety System, an anti-theft system, a Blind Spot Monitor, front energy-absorbing crumple zones, Tire Pressure Monitor System, side curtain airbags, daytime running lights and more. To provide you with the peace of mind to enjoy driving the Sequoia on a routine basis, the full-size SUV comes with an extensive warranty. The Sequoia comes with a 3-yr./36,000-mile basic warranty, 5-yr./60,000-mile powertrain warranty, and 5-yr./unlimited mile corrosion warranty. With the Sequoia's comprehensive warranty, you can drive the full-size SUV without having to worry about something going wrong. When it comes to getting into a full-size SUV that can seat up to eight passengers and tow an impressive amount of cargo, the 2016 Toyota Sequoia is a great option. At Team One Toyota in Rainbow City, AL, drivers can survey a vast selection of Toyotas in stock and will get a first-class experience. Visit Team One Toyota at 937 W Grand Ave. and discover the Sequoia today.